Vine City is most famously known as the location Dr. Martin Luther King Jr. relocated to during the civil rights movement after his home in Alabama was bombed with his wife and 10-month-old baby inside. 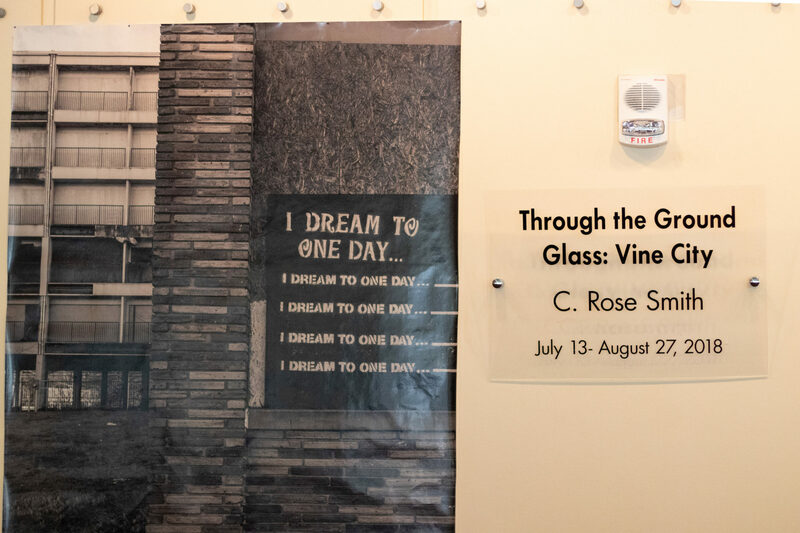 As Vine City currently faces urban redevelopment, C. Rose Smith’s work serves as a protest piece to comment on the historic value of black communities while advocating for affordable housing. “I became passionate about telling a true narrative of their community and what it means to them,” Smith said. While in Vine City, Smith became inspired by its rich history. Dr. Martin Luther King Jr.’s former home, the Paschal brothers’ former restaurant and the Herndon home left her with a desire to explore how they were all connected to the civil rights movement. Witnessing the present-day transition of the neighborhood influenced her to use photography as a visual narrative method to discuss the social issue of gentrification that affects the working class. Because Smith is in the process of developing additional visual narratives for other communities along the east coast, the final title of her series is still in transition. The Vine City narrative is part of Smith’s broader “Inner City Urban” series where she integrates herself into working-class communities to illuminate their history and show the truth behind neighborhood redevelopment. The title, “Through the Ground Glass: Vine City,” was based upon her use of a large format 4×5 camera. The camera uses a ground glass, which is a piece of frosted glass in the camera’s viewfinder, that scatters light. Smith noted that the term doubly reminded her that she is “grounded.” She is quite literally on the ground, taking to the streets to serve and share true narratives about communities that are treated unjustly. Smith’s art installment was open to the public from Aug. 2 to Aug. 27, with her opening ceremony as a part of Downtown Atlanta’s First Thursdays ArtsWalk. Although Smith is a Memphis native, the artist is no stranger to Atlanta. She calls Atlanta home and moved to the city when she was 11 years old. She was initially inspired to take a stand against urban redevelopment while seeing the changes first-hand in her cousins’ neighborhood located in the West End. Once Smith visited Vine City, she knew she had something to say—whether that be through a single art exhibit or several around the country. Smith knew she couldn’t walk away from the history and wanted to show what is happening to the community, as transparent as glass.